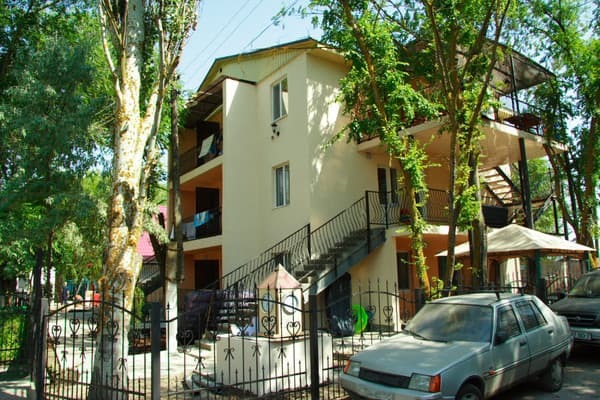 Holiday Village "Dacha" is located on the Black Sea coast in the center of the fishing area Rybakivka, 50 meters from the sea. The hotel is a three-storey building consisting of 20 rooms of block type. 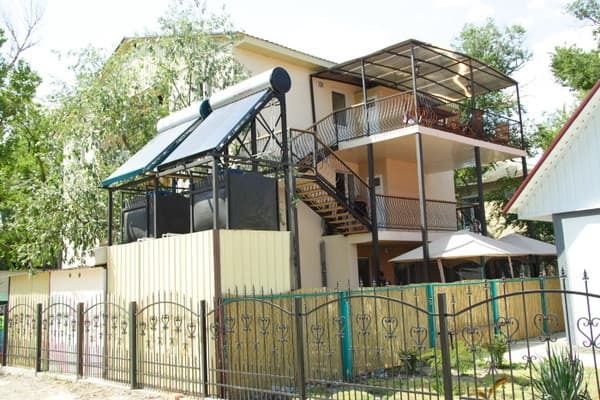 Each room has comfortable furniture, cable TV; Rooms on the 2 nd and 3 rd floors are air-conditioned. Bathrooms are located in blocks and in the recreation center. In each block there is a kitchen with a complete set of utensils, a stove, refrigerators and all necessary kitchen utensils. 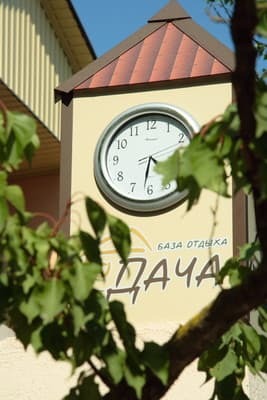 To services provided by the hotel "Dacha": children's playground, library, recreation areas, arbours, "barbecue center" (barbecue, skewers, grills, kazan), pump-room with drinking water. There is also paid parking on site. In 50-100 meters from the base there is a grocery market, a lot of various cafes, bars, shops. The distance to Berezanka is 32 km, Koblevo - 15 km, Nikolayev - 70 km, Odessa - 72 km. 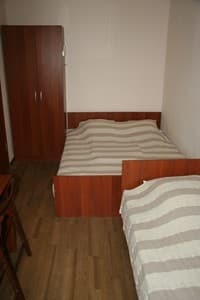 Description of the room: One room is equipped with a bed, table, chairs, wardrobe. This is a block category number. In the block for 2 rooms there is a kitchen with all necessary accessories, a refrigerator, a stove. A bathroom in the base. 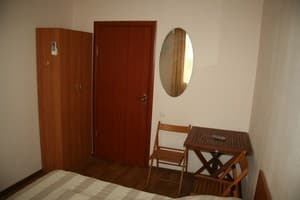 Description of the room: One room is equipped with a double and single bed, table, chairs, wardrobe, balcony. This is a block category number. In the block there is a kitchen with all necessary accessories (refrigerator, stove). A shared bathroom is not a base area. 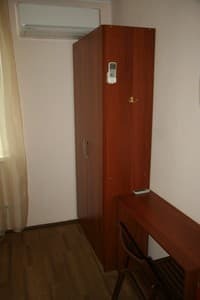 Description of the room: One room is equipped with a bed, table, chairs, wardrobe. This is a block category number. In the block for 2 rooms there is a kitchen with all necessary accessories (refrigerator, stove, sink). A bathroom in the block, showers in the base. Description of the room: The rooms of this category are located in a block consisting of 4 rooms. In the room: one-and-a-half bed, table, chair, wardrobe. In the block: kitchen with all necessary accessories, two bathrooms, shower room, large terrace with wooden furniture (2 tables, 12 chairs). 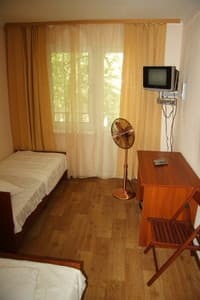 Description of the room: One room is equipped with a double and single bed, table, chairs, wardrobe, balcony. This is a block category number. In the block for 2 rooms there is a kitchen with all necessary accessories (refrigerator, stove, sink). A bathroom in the block, showers in the base. 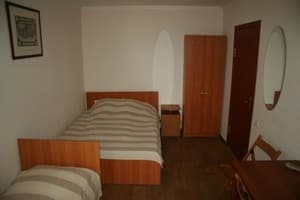 Description of the room: One room is equipped with a double bed, table, chairs, wardrobe. This is a block category number. In the block for 2 rooms there is a kitchen with all necessary accessories, a refrigerator, a stove. A bathroom in the base. 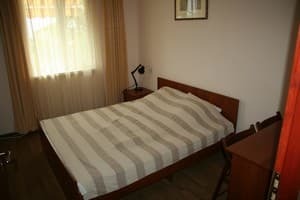 Description of the room: One room is equipped with a double bed, table, chairs, wardrobe. This is a block category number. In the block for 2 rooms there is a kitchen with all necessary accessories (refrigerator, stove, sink). A bathroom in the block, showers in the base. Description of the room: The rooms of this category are located in a block consisting of 4 rooms. 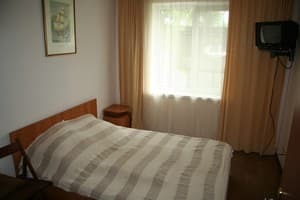 In the room: double bed, table, chairs, wardrobe. 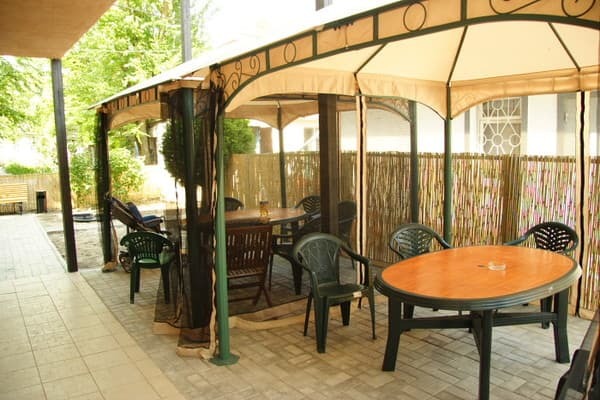 In the block: a kitchen (two refrigerators, two plates, a microwave, a freezer, a hot water sink), two bathrooms, a shower room, a large terrace with wooden furniture (2 tables, 12 chairs). 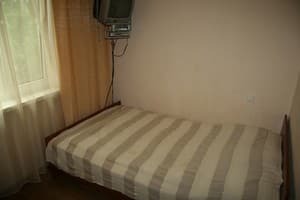 Description of the room: One room, equipped with a double and single bed, table, chairs, wardrobe, air conditioning, balcony. This is a block category number. In the block for 2 rooms there is a kitchen with all necessary accessories (refrigerator, stove, sink). A bathroom in the block, showers in the base. Description of the room: The rooms of this category are located in a block consisting of 4 rooms. In the room: double and single beds, table, chairs, wardrobe, balcony. 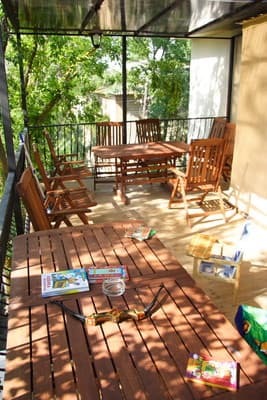 In the block: a kitchen (two refrigerators, two plates, a microwave, a freezer, a hot water sink), two bathrooms, a shower room, a large terrace with wooden furniture (2 tables, 12 chairs). Children under 2 years without additional space are accommodated free of charge, up to 5 years (without place) - payment 70 UAH (utilities), up to 12 years - 20% discount. The cost of additional space is 50% of the basic one. In each block consisting of 2 rooms - a kitchen with a full set of dishes, a stove, a refrigerator, a sink with hot water (2-3 floors). At 50-100 meters from the base there is a market where a variety of fruits, vegetables and other products are in abundance. The hotel is near the village. Fishing, in the center of the resort area, 50 meters from the sea. The distance to Koblevo is 15 km, Berezanka - 32 km, Nikolayev - 70 km, Odessa - 72 km. Coordinates: N 46o37'29.3 '' E 031o23'4.8 '' (N 46o37,489 'E 031o32,081'), (N 46.62481 ° E 31.3846o). By car: the 74th km of the Odessa-Nikolaev highway (E58), turn to Rybakovka, then 18 km turn left to the AS "Recreation bases", to the right (200 m) to the hotel. By train: to Odessa or Nikolaev. It is also possible to get a taxi from the railway station in Nikolaev or Odessa.